Space shuttle Atlantis rolls over to the 52-story Vehicle Assembly Building at NASA's Kennedy Space Center in Florida on May 17, 2011. Atlantis is slated to fly the last mission of the space shuttle program, STS-135, in July. CAPE CANAVERAL, Fla. — Just one day after the shuttle Endeavour launched for the last time, its sister orbiter Atlantis is making one final trip from its processing facility to the giant building where it will be stacked for its very last launch. Today's maneuver, called "rollover" in NASA parlance, began at a building called the Orbiter Processing Facility (OPF) here at Kennedy Space Center, where Atlantis has undergone inspections and maintenance since landing after its last voyage, the STS-132 mission, in May 2010. From there, Atlantis traveled out on a giant 18-wheel transporter platform, where it paused to allow shuttle workers to take photos alongside it. The rollover holds emotional significance for the team of thousands of NASA civil servants and contractors who have worked on Atlantis, many for the whole of its almost 26-year life. Atlantis' four-astronaut STS-135 crew — commander Chris Ferguson, pilot Doug Hurley, and mission specialists Sandy Magnus and Rex Walheim — also showed up to mark the occasion. After their last missions, NASA's three orbiters will be retired to museums. 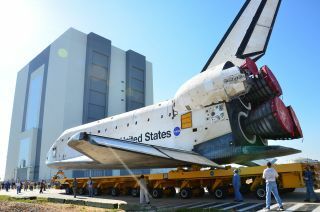 Atlantis will come back here to the Kennedy Space Center Visitor Complex, while Endeavour will go to the California Science Center in Los Angeles and Discovery will be sent to the Smithsonian National Air and Space Museum's Udvar-Hazy Center outside Washington, D.C.